I’ll be doing 20 minutes in Edmonds on Friday, December 11th, 2015. 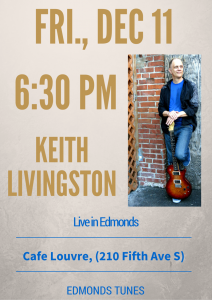 It’s for Edmonds Tunes, at Cafe Louvre, (210 Fifth Ave S). I start just after 6:30 and am only playing 5 or 6 songs — you don’t want to miss any of them (well, maybe one). I might even trot out some stuff I’ve never played live before, if I have time to get it worked up and semi-rehearsed. And I suppose it’s late enough in the year to force the Christmas tune I wrote on you. Previous Post New Groove Next Post Queen, or AC/DC?